First time printing? Do any of the common printing terms seem like they’re in a foreign language? Do you want to be sure that you have thought through all of your options and felt all the papers and finishes that we offer? We heard you! This double-duty, double-sided paper sample pack contains important information on file setup as well as samples of our papers in an easy-reference wirebound book. The front of each page is a repeat of a series of images so that you can see how your image looks on different papers and with different coatings. Turn the book over and read it from the other direction – the pages contain file setup tips, samples of specialty options, etc. A complete selection of paper samples. Don’t know your 105 pound matte from your 10 point gloss? Want to understand how the weight of the paper might impact your final piece? You’ll have samples of every paper right in front of you to help with those decisions. If you’d like to see samples of recent book printing work that we’ve done for our clients, we offer a deluxe print sample pack. 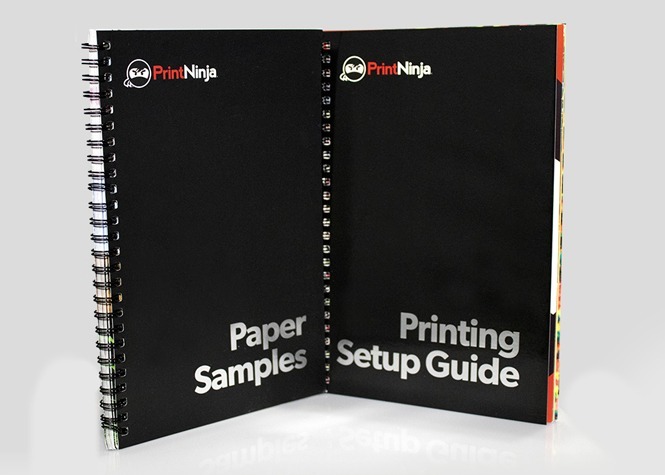 The deluxe book sample pack includes the paper sample pack / print setup guide, plus 2-3 copies of projects that are similar to the specs that you’re considering. After ordering, an account manager will work with you to figure out just what you’d like to see (“I’m printing a graphic novel, 280 pages, on 85 lb gloss paper – can I see what that would look like?”) and select some recent pieces to send to you. The price of a deluxe print sample pack is $25, and that cost is refundable with purchase. Our standard book paper sample pack gives creators first-hand experience with the custom options that they can add to their projects to make them the tools that they need to make great decisions about their projects. On the left page (shown upside-down) is an example of 135 lb gloss text with the three recurring images. The right page shows the impact of different file image resolutions on the final printed product. The wirebound book contains samples of each of our paper weights in various finishes to give you the information that you need for the feel of your project. We repeat the same images on each page so that you can see what different artwork might look like on different paper weights. Paper selection and paper finish selection are among the two most important printing options that you’ll choose, and having samples on-hand is a great way to build confidence in your selection. The back of the samples contain samples of foil stamping, sequential numbering, spot UV coating, and so on. These are great options for creators that want to distinguish their offering, and having the samples on-hand can get your creative juices flowing as well as take some the mystery out of the jargon!